Director – Rafael Portillo, Screenplay – Alfredo Salazar, Story – Guillermo Calderon Stell & Alfredo Salazar, Producer – Guillermo Calderon Stell, Photography (b&w) – Enrique Wallace, Music – Antonio Diaz Conde, Art Direction – J. Torres Torija. Production Company – Cinematografica Calderon S.A.. The criminal mastermind Dr Krupp, alias The Bat, has been arrested by the police but his associates contrive to spring him during a prison transfer. The masked wrestler known as The Angel tries to stop them but they get away. Krupp then sets about trying to obtain the artefacts of the Aztec Mummy once again but these have been reburied by Dr Eduardo Almanda. In order to find the way to the tomb, Krupp abducts Dr Almanda’s fiancee Flor, who recalled her past life as the Aztec Mummy’s forbidden love under hypnosis. Dr Almanda and The Angel try to stop Krupp’s plan. 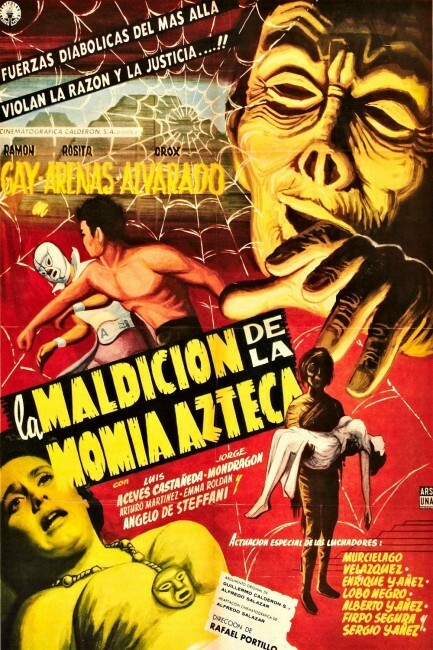 This was the second of the Mexican-made Aztec Mummy films. The series began with The Aztec Mummy (1957) in which professor Ramon Gay conducts an experiment in hypnotic regression on his fiancee Rosita Arenas whereupon she discovers a whole other past life as an Aztec handmaiden. (The Bridey Murphy fad – for detail see the film version The Search for Bridey Murphy (1956) – in which a Colorado businessman claimed to have hypnotically regressed a housewife to recall her previous life in 19th Century Ireland had just caught the public attention and this was one of several films that quickly adopted hypnotic regression/past lives themes). They go in search of her tomb only to awaken the mummy of her former love. The Aztec Mummy was popular and spawned a series of sequels beginning with The Curse of the Aztec Mummy and followed by The Robot vs the Aztec Mummy (1958) and Wrestling Women vs the Aztec Mummy (1964) wherein the series was crossed over with the Wrestling Women who went through a five film series of their own. The Aztec Mummy films are not very good. They are made on budgets that make the production values and shooting schedules of the serials of the 1940s look generous. Rafael Portillo’s camera set-ups are all the same ones used by serial directors – static master shots, usually from a medium or wide angle, and only occasionally cutting up within the space of a scene. The pace is dreary, something added to by the lack of musical score in many scenes. The one scene where the action does perk up is where The Angel is trapped in a room with floor panels that slowly slide into the wall, leaving him having to hang by the light shade over a pit of snakes – although there is a anticlimactic denouement to the scene where he uses a radio he has on his person to call Dr Almanda’s young son to come and rescue him. With The Curse of the Aztec Mummy, the Aztec Mummy sequels began the habit of including lengthy amounts of stock footage recapping scenes from the previous film – although there is only a few minutes worth of footage here, this took up three-quarters of the film by the time of the subsequent The Robot vs the Aztec Mummy. The disappointment of this film is that despite the title claiming to be about the Aztec Mummy, the mummy only turns up at the 51 minute mark (of a 63 minute film) and most of the show is about the routine stuff of the villain Dr Krupp’s escape from custody and attempts to abduct the heroine. One of the other oddities about The Curse of the Aztec Mummy is that it throws a masked wrestling superhero into the mix. This was one of the very first appearances of a luchadore (masked wrestler) hero in a film. The first luchadore film to appear was the non-genre The Magnificent Beast (1953), which was apparently a great success; the first genre attempt was The Body Snatcher (1957), which came out only two months before this. El Santo, the most famous of the masked wrestlers, only made his first appearance on movie screens the year after this. The Angel is not strictly a wrestler as we never see him in the ring, although he does employ fight moves. He is also perhaps the only masked wrestling superhero on Mexican screens to be unmasked and have his identity revealed at the end.